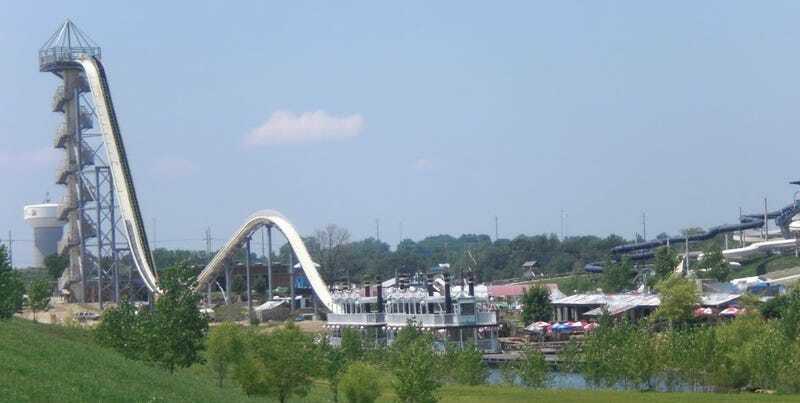 The world's tallest waterslide, located in Schiltterbahn's Kansas City waterpark, opened to the public this Thursday. I had the honor/horror of being part of that public. This is my story. It's 168 feet and 7 inches tall. That's about 51.38 meters if you use the metric system, and a little more than 168.5 $5 footlongs if you use the Subway system. It goes between 40 and 50 mph depending on your weight and whether or not anxiety farts can propel a watercraft to go faster. Its first drop is, in strictly scientific terms, super-effing steep. If you're curious how one survives a waterslide with that kind of statistical baggage, let me be your sage guide, one who was pleasantly surprised not to have peed herself at all at any point, no sir. Not just any friends. You'll need one to two friends (you can make them in line; the very best case scenario is about a two-hour wait, so you've got plenty of time). They'll need to be taller than 54 inches, weigh a collective 400 to 550 pounds between all two or three of you—presumably if you're under the limit you'll just fly off into the air after that first hump, like the end of Charlie and the Chocolate Factory—and with whom you feel comfortable verbally agreeing to a situation that includes the possible risk of death. I've never heard people so excited to be told they're 400 to 550 pounds. No, really. Before you ride, they ask you things like if you're pregnant or have any physical ailments, and oh P.S. are you cool with the chance of maybe dying? And you're just like, "Sure! One ticket for possible death please!" There are 264 stairs that lead to the top of the Verrückt, which may not sound like an insane amount if you're bad at visualizing numbers like I am. It's probably more helpful to think of the total trip as 17 flights of stairs, which as you might imagine gives you plenty of time to consider just how high up you are and how far down you have to go and if you need to make any adjustments to your will. Comforting factoids along the way. The walk up is decorated with signs that give you a perspective of just how high up you are. I'm guessing they're also meant to distract you from the fact that you're only halfway there and just learning you might have stair climbing-induced asthma. A fun game you get to play at the top is to see how much weight you lost in sweat when they weigh you for a third and final time. We collectively lost one pound. "Welcome to the top of the world's tallest waterslide." "Please make your way to the raft at the top of the world's tallest waterslide." "Please don't start cry-puking at the top of the world's tallest waterslide." I don't think I've ever taken part in something that was the declared "-est" of that thing. So, it made me feel very accomplished, which was a nice feeling to feel right before they strapped us into what could potentially be our own personal water coffin. One of my final sentences before going down was, "Has anyone vomited on this thing yet?" To which one person responded, "No. So don't be the first." For me, the scariest part of the ride was when they inched our raft to the top of the slide and announced "30 seconds" as in "Your ride will start in 30 seconds" as in "Enjoy what may be the last 30 seconds of your existence." And then we were off. Before I could finish yelling, "Clear my browser history upon death," we were falling down that first insanely steep drop, which in the moment felt like going off a waterfall while Velcro-ed to a pool noodle. That drop is so jarring and quick that the hump at the end of the slide feels like a kiss on the cheek from an angel baby who also spits on you a little. And then you float, checking to make sure you're still registering a heartbeat. The whole thing lasts about 15 seconds. Surviving the Verrückt was very much worth it, in that once-in-a-lifetime/potential-last-moment-of-your-lifetime sort of way. I give it five $5 footlongs, 17 flights of stairs, and all my thumbs. Mia Mercado is a writer based in Kansas City. We can confirm that she is indeed still alive.